Green lentils are so damn diverse! We've been eating TONS of Mexican food this week and I'm not even mad. Having a hearty burrito for lunch or a Mexican rice bowl for dinner is always satisfying. Since I've gone vegan, I've realized that Mexican food is one of the easiest culinary styles to substitute meat and cheese in. 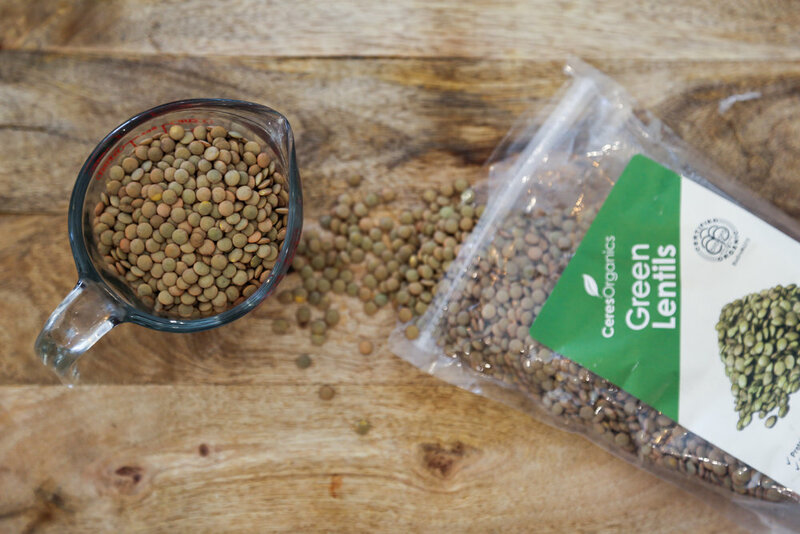 Lentils in general, but green ones in this case, have become a staple in our Mexican-meal-making. It all starts with some onions and garlic tossed in olive oil. Talk about a good smellin' kitchen! When we decided to make these vegan enchiladas with a vegan enchilada sauce, we whipped out the jalapeños to kick it up a notch. Once the meal started looking colorful, we got away with ourselves and realized we could create a rainbow with a glass of wine and...a blue dish towel. There weren't exactly any blue foods we could toss in this one off-the-bat. We kept laughing about how corny it was, but hey, we got every color in there! Blue dish towel & red wine completes the rainbow...it's crucial to the enjoyment of this dish. We don't recommend eating the dish towel, but we do recommend drinking the wine. As long as you have something blue in the room, you can definitely complete the rainbow with this recipe. Buy organic ingredients whenever possible. 1. Preheat oven to 315˚F/190˚C. 2. Heat olive oil in a pot on medium heat. 3. Add onions & garlic. Cook for 4-5 minutes until tender and translucent. 4. Put half aside for sauce. 5. Add the rest of the ingredients to the remaining half still in the pot. 6. Mix together and cook covered for 10 minutes over a medium heat. Taste and adjust flavor as needed. 7. Set aside while making sauce. That spicy filling is a lip-lickin' delight! Pack them in like little sardines! 2. Add more thickener if you prefer a heavier sauce. Add more water if you prefer a thinner sauce. 3. Pour half the sauce into a baking dish and spread evenly across bottom. 4. 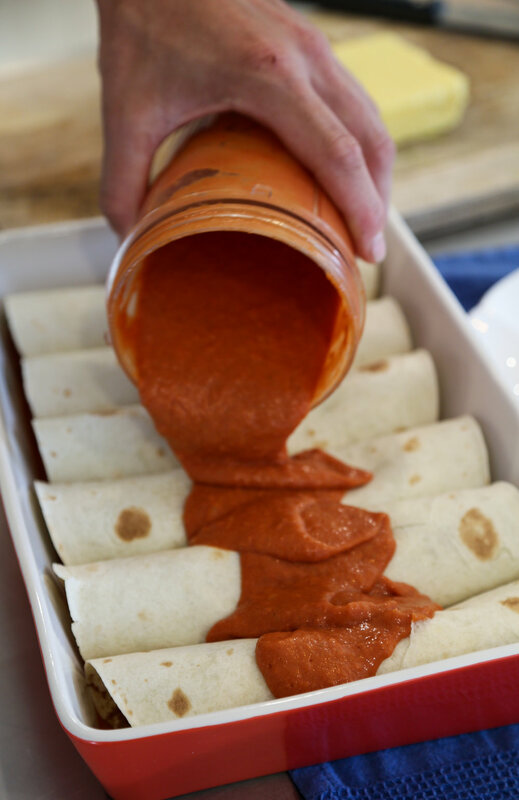 Add enchilada filling to tortillas; roll and place into baking dish in a row. 5. Drizzle remaining sauce over the row of enchiladas and top with grated vegan cheese. 6. Top with multi-colored jalapeño peppers. 7. Bake in oven for 15-20 minutes. 8. Serve with a side of smashed avocado, lime juice, salt. 9. Pour a glass of red wine.